HOUSTON- Tom Brady may have won Super Bowl MVP, but there were many players that had amazing games. Here are the players on both teams that were in the conversation for most valuable player. There was no bigger star on the field than the MVP of the game and a quarterback considered by many (most?) as the best of all time. Brady set numerous records in this game. He set the records for most Super Bowls played (7) while tying hall-of-famer Charles Haley for most Super Bowl victories. In the game he set the Super Bowl record for most pass attempts (62), most completions (43), and most passing yards (466), while setting career records for most pass attempts (309), most completions (207), and most touchdown passes (15). His stats and performance on the game were as impressive as they come despite a first half that looked anything but. In Super Bowl XLIX Tom Brady was the MVP but Malcolm Butler won the Patriots the Super Bowl. In Super Bowl LI that man was James White. 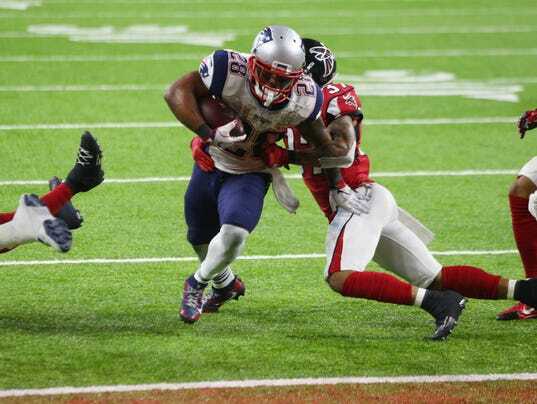 In an all-time great Super Bowl performance James White set the record for receptions in a game with 14, despite being a running back, rushed for two touchdowns and a two point conversion and caught another. For those keeping track at home he was almost single handedly responsible for 20 of New England’s 34 points. Brady absolutely deserved the MVP, but there is most certainly a case to be made for James White. Amendola had been pretty quiet all season, but he stepped up in a big way on the biggest stage. On the season he only had 23 catches for 243 yards and 4 touchdowns. Yet when trying to claw back into the game, Brady relied on his most consistent targets of which Amendola has become over the past few seasons. Amendola was responsible for three of the biggest plays of the game. The first was his touchdown catch early in the fourth, then came a great catch across the middle on the final Patriots drive in regulation that would put them in the redzone, and finally the game tying play when he punched the ball in for a two point conversion. He may not have been flashy, but he was one of the most important pieces in this game. The Catch. Reliability. Clutch. Edelman’s statistics on the game are not absurd, he didn’t himself find the endzone, and he did have a drop or two, but when it mattered most he came through for Brady. 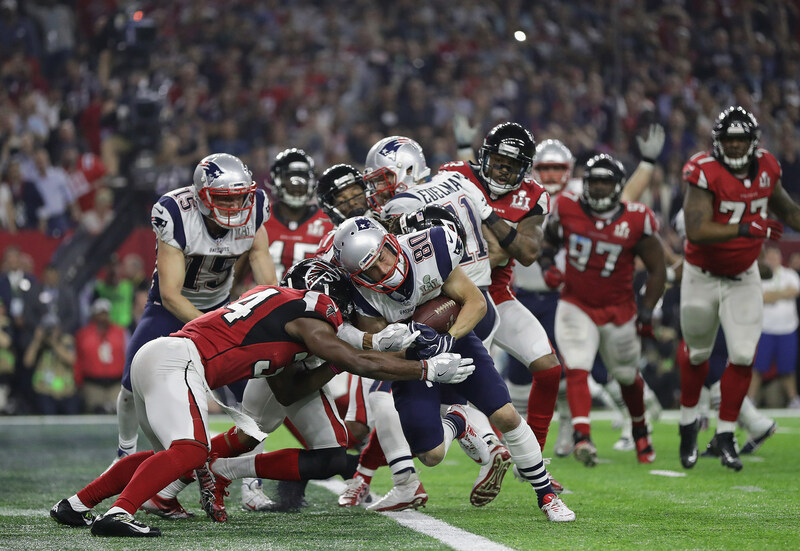 With 2:28 left and down by eight points it was Edelman who made one of the most amazing catches in Super Bowl history to get the Patriots across midfield and in position to score and tie the game. He was a go-to on third down and tough situations throughout the game. With 8:35 remaining and down 28-12, New England needed a big play from their defense. Dont’a Hightower decided he would be that playmaker. In arguably the most important play of the game, Hightower blew by the Falcons O-line on a five man rush to knock the ball out of Ryan’s extended arm. That got the Patriots the ball at the Falcons 25 yard line which they were able to capitalize on a make the game just one possession. Hightower may have only had two tackles in the game, but one of them was the biggest of his career. With around four minutes remaining and an eight point lead, a field goal could have essentially won the game for Atlanta. They were also pretty much in field goal range. 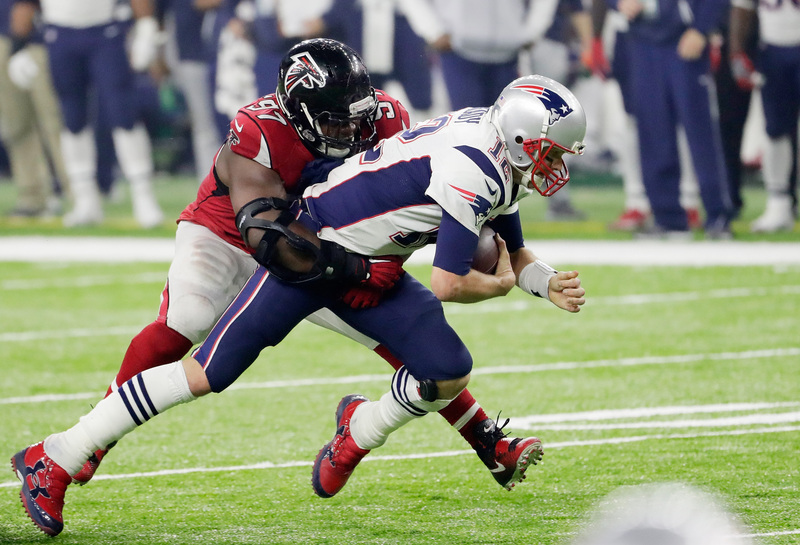 Trey Flowers, an emerged star for New England, made one of the most important plays of the game when he burst through the line and sacked Matt Ryan to take them out of range which would eventually force them to punt. That was just one of 2.5 sacks on the game for Flowers, half a sack short of the Super Bowl record. Matt Ryan would have been MVP of the league and the Super Bowl if he had managed to pull out a win. Going up 28-3 against the New England Patriots was perhaps the most impressive feat of his career, blowing that lead was perhaps the lowest point. Ryan nonetheless had a very good game and the loss was not his fault, taking the late fourth quarter sack notwithstanding. Ryan was perfect in the first half, literally. He was the first quarterback in Super Bowl history to ever have a perfect 158.3 passer rating in a half. He complete 7 of 8 attempts for 115 and a TD, clearly outplaying his counterpart Brady. Even though it won’t be, his performance in that half should be remembered as great. It seemed like Grady Jarrett was hitting Brady on every single play. He only got him on the ground three times, but he certainly influenced more throws in a dominating performance. His three sacks ties the Super Bowl record for most sacks in a game. Two of those sacks came at a very important time with just over ten minutes to go in the game and the Patriots in on the goal line down 28-9. Jarrett sacked Brady on both 1st and 3rd down to force just a field goal and preserve a 16 point lead instead of potentially an 11 point lead. Despite not winning, his performance helped get that lead and preserve it for as long as they did. Alford had the play of the game for Atlanta when he jumped an inside route on 3rd and 6 just before the 2 minute warning in the first half and returned the interception 82 yards for a score. That increased his team’s lead from 14-0 to an absolutely dominant 21-0. He is the only player to ever pick-six Brady in the playoffs. Besides the interception he had nine tackles and actually made a great play on what would end up being Edelman’s amazing catch.